Chefs concerned about food waste – and their bottom line – are incorporating every last leaf and rind of fruit and veg into their dishes. Could you try stem-to-root cooking, cut landfill and get two or three meals for the price of one? Here’s my experience. Don’t dump the leaves and stalks after you’ve magicked cauli florets into cauliflower rice, pizza bases, mash or even cake. Simmered with onion, veg or chicken stock and Parmesan rind or a cube of cheese – plus a bay leaf to keep the school dinners pong under control – leaves and stalks make a creditable cauliflower cheese soup. The first time I made it, I was amazed that a cauli soup containing no florets could taste so, well, cauliflower-ey. Works for broccoli, too. As a child, I saw a Swedish student guest of ours eat an apple right down to the stalk. Core, pips, the lot. I was gobsmacked. For her, it was normal. She didn’t grow an apple tree inside her, or at least, I didn’t hear about it. I used to throw away raw Bramley apple skins. I even chucked baked apple skins as I find the leathery texture repellent. One day I massaged a tablespoon of maple syrup and one of olive oil into the peel from the bagful of cooking apples I’d just prepared. I added a pinch of sea salt and a teaspoon of mixed spice, spread them out on a silicone sheet and baked until crisp and golden. Result: apple crisps, no waste and a kitchen smelling like apple pie. Kids would love making and eating this snack. I haven’t yet tried savoury veg crisps with the skins of potato, carrot, parsnip and beetroot but watch this space. Masterchef winner, Nadiya Hussain’s, gran uses clementine peel in this fish curry. You can also freeze spare citrus rind for use later in stews, orange cake, marmalade, scented orange-and-cinnamon rice pudding and biscuits. 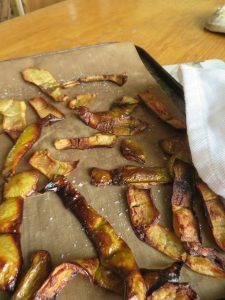 You can also make candied peel. I put shavings of orange or lemon peel in the teapot to make citrus redbush tea, lemon Earl Grey tea or lemon and fresh mint tea. Refrigerate the brewed tea, add ice and extra peel and you have a caffeine-free summer cooler. You can freeze chunks of peel plus flesh, squeezed or intact. 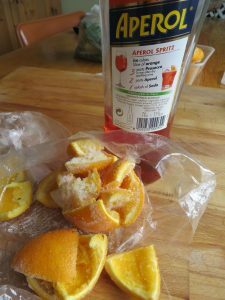 Freeze individually so they don’t stick together, then store ready to drop into gin and tonic, Campari spritzers, Negronis, water jugs or mulled wine according to the season. Stash Parmesan ends in your freezer and use to add a savoury hit to meat sauce for pasta, minestrone or cauliflower soup – see above. Nigel Slater invented a leek and potato soup to use up his rinds. 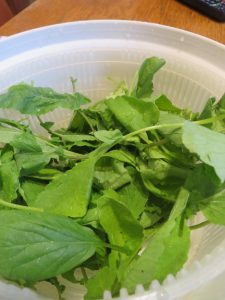 While most supermarkets sell trimmed radishes, at a farmers’ market, you should get a big enough fistful of perky radish leaves to create another vegetable side. Try a Japanese-style radish leaf pickle, make radish top pesto or cook briefly and use as a pizza topping in this Jack Monroe recipe. Radish leaves yellow rapidly so use the day you buy. They are an acquired taste in salads as the leaves are hairy and strong. I prefer them in pesto: blitz equal parts of pecorino and ground almonds, a good handful of washed radish leaves, olive oil and a sliver of lemon peel. With beets from an allotment or farmers’ market, you get not just the roots but also the dark green leaves, complete with their beautiful vermilion ribs. Snip the ribs out of the leaves with scissors, then cook in half an inch of boiling water until al dente. Dress with olive oil, seasoning and vinegar. Raspberry vinegar goes particularly well with all parts of the beetroot plant. The leaves will need a little light boiling and for my money, have more flavour than spinach. I like the boiled ribs of cavolo nero dressed with sesame oil, soy sauce and toasted sesame seeds or with a tahini lemon dressing. This elevates them from compost discards to classy dish. Your leftover parsley stalks, celery ends, spring onion ends, green ends of leeks, chicken bones from boning chicken thighs and so on will, of course, go into your stock pot freezer bag ready for the next time you’ve got a bird to boil. Or make veg stock. Helping my sister to prepare Brussels sprouts, I noticed that she drained the cooking water into a jug ready to make her gravy, thus losing none of the vitamins from the green vegetables. This is a habit she learnt from our mother who grew up in wartime. 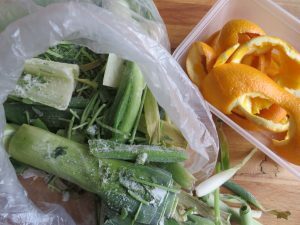 What fruit and veg parts do you eat that others throw away? Have you prevented anything going into the bin or down the drain?